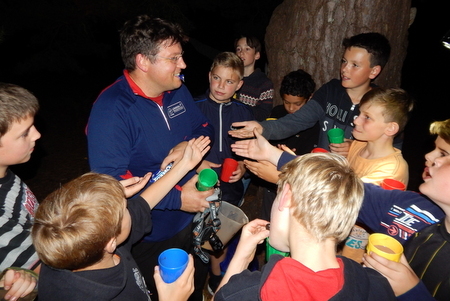 On Friday 2nd October, 15 excitable lads (and the Junior leaders), ventured up Chinthurst Hill for some night games. The ‘warm-up’, led by Jagat and Charlie, created the scene of Cops and Robbers, and the challenge to get the looters tower, without being caught. This was followed by a traditional game of ‘1,2,3 Arnie!’ (for those unaware, this a Urban Saints Guildford version of British Bulldog). After the lads’ energy had been partly exhausted, Tuft gave a thought provoking talk referring to Psalm ch. 119 v. 105 (“Your word is a lamp for my feet, a light on my path”). This was followed by Rob’s legendary chilli hot chocolate, with an Oreo, of course! The final game was Spotlight, in which the lads had to make there way to the tower without being lit up by a leaders torch. This proved tricky, but lads were able to get through the leaders defence in the end!